The Innkeeper's Dream on CD! is now available on CD with a special BONUS live performance as well! *Please note: Shipping prices are for US orders ONLY on all products. For those outside the US, please contact us via email with your desired order and complete address for accurate shipping costs. For twenty-six years, David's inspiring mix of drama, mime, storytelling & singing communicated the Word of God in a relevant way to people of all ages, drawing audiences across America, Canada and abroad into an encounter with Jesus Christ. In one of his most creative projects, David uses a rose bush as an analogy for Jesus Christ. This creative CD describes Creation, the Crucifixion and the Resurrection in a unique and creative way. With David's dramatic voice and beautiful orchestration and poignancy throughout, this poetic trilogy will go deep into the heart of both the believer and those still seeing. Each CD is approximately 30-45 minutes long and was recorded before a live audience. Enjoy all three stories from work, car or at home on our newly re-mastered digital recording from David's wonderful Allegorical Trilogy that has touched thousands of all ages since 1990. Part I (The Great King) is an allegory of the Gospel. The Great King sends His Son down the mountain to rescue the children who have fallen prey to the lies of the ruler of the dark domain. Part II (Children of The Great King) is an allegory of the Great Commission in which the children who have been rescued and made it t the top of the solid stone mountain ask The Great King if they can go back down the mountain to rescue the other children, "Because we remember what it was like down there." Part III (Return of The Crown Prince) is an allegory of the Second Coming of Christ and was David's favorite of the three stories. "The part in the story where the untrusting, skeptical children are lovingly dealt with by The Great King reminds me so much of the many of the children we have at our camp. The prince of the dark domain has fed them so many broken promises that they have a very difficult time believing that anyone would want to fulfill any promise to them. In the sharing of this story, you have become a 'Repairer of Broken Walls' (Isaiah 58:10-12) especially the broken wall of trust." My parents met David performing at a dinner party event at Chico Alliance church near Silverdale, WA if I'm not mistaken. They had brought home The Great King cassettes, and we kids listened to them over and over and over. As I grew up the story stuck with me and as my faith grew I saw different elements of it in beautiful new light as more and more of God's story in my life was being revealed. I wanted to have the story for my children when I have them, and for their children as well. Truly an amazing story and a remarkable man. Written by Steve Thomas, JONAH! is based directly on the book of Jonah in the Old Testament. David characterizes this historical and somewhat "hysterical" bible hero during the hardest lesson of his life: Obedience. While "Repent!" is the well-known theme of the book (and performance), an applicable challenge for day-to-day Christian living punctuates this performance. Recorded live, approximately 35 minutes. 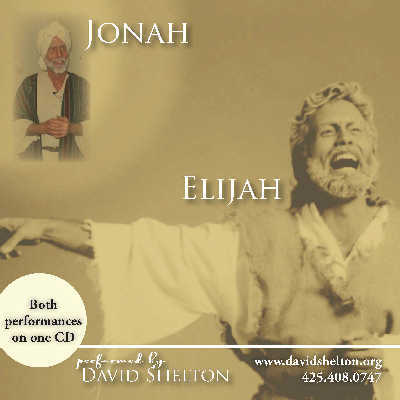 Also written by Steve Thomas, David's captivating performance shares the prophet Elijah's experience on Mt. Carmel and culminates with his victory over the Baal priests as he calls down fire from heaven. Taken directly from I Kings, Chapter 18, this sometimes humorous CD is a great encouragement for anyone who is up against seemingly insurmountable odds. For 23 years, David enjoyed presenting the book of James word for word. Adding an intro and altro in the character of "Michael" and using an Irish accent, David shares this straight scripture practical epistle of James. One of our bestsellers. Great for personal memorization or for sharing with your bible study! *Please note: Shipping prices are for US orders ONLY on all products. For those outside the US, please contact us via email with your desired order and complete address for accurate shipping costs.